Technology can play an essential role in developing solutions to combat the threats of limited natural resources and the increasing demands our daily operations put on those resources. In IT, a proven and widely adopted technology called virtualization has revolutionized how we design, build, and operate server rooms, data centers, and desktops in order to increase capacity and availability while reducing environmental impact. Virtualization dramatically improves the utilization of computers by leveraging untapped resources to do more without consuming more. In a small office, this can mean using one or two physical servers to run six, ten, or as many as twenty "virtual" servers on the same hardware. How Does Virtualization Help the Environment? Using less hardware equates to less power, waste, and heat production. In a small business with eight servers, virtualization can reduce power consumption by as much as 70%. In large data centers with hundreds of servers, the power savings is incredible. Less power, less computing hardware to recycle, and less air conditioner usage: it all adds up to less fossil fuel usage and huge reductions in carbon output. VMI is a communication mechanism between the guest operating system and the hypervisor. This interface enabled transparent paravirtualization in which a single binary version of the operating system can run either on native hardware or on a hypervisor in paravirtualized mode. 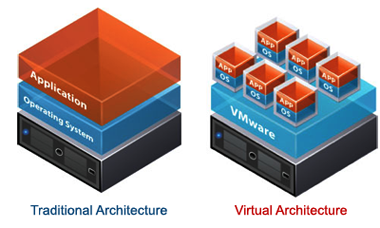 Server virtualization is a technology for partitioning one physical server into multiple virtual servers. Each of these virtual servers can run its own operating system and applications, and perform as if it is an individual server. This makes it possible. Server virtualization presents interesting implications for disaster recovery (DR), including cost reductions and increased recovery times. With traditional tape systems it can take one to two days to completely restore a system. Server virtualization can reduce full restoration to four hours or less because it’s not necessary to rebuild servers, applications or operating systems separately.